Start off your visit on the 7th (Fri): look for gifts at Babu Tea & Coffee and then enjoy the sand and surf at Utorda Beach. On the 8th (Sat), you'll have a packed day of sightseeing: contemplate in the serene atmosphere at Shanta Durga Temple and then wander the streets of Old Goa. To see maps, photos, traveler tips, and more tourist information, go to the Goa tour itinerary maker site . Indore to Goa is an approximately 3-hour combination of flight and taxi. You can also drive; or take a train. Plan for much warmer nights when traveling from Indore in December since evenings lows in Goa dip to 27°C. 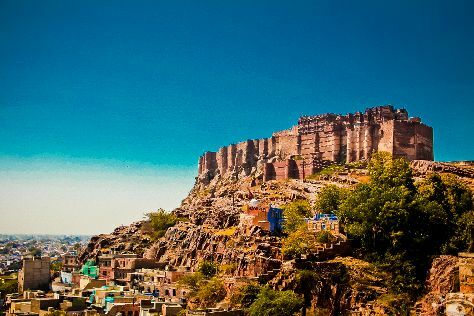 Finish your sightseeing early on the 8th (Sat) so you can travel to Jodhpur. Start off your visit on the 9th (Sun): whizz through the canopy at some of the top local zipline courses and adventure parks, then contemplate the long history of Mehrangarh Fort, then stop by Mohanlal Verhomal Spices (MV SPICES), and finally contemplate in the serene atmosphere at Surya Temple. To see maps, where to stay, ratings, and other tourist information, read our Jodhpur journey planner . Traveling by combination of taxi and flight from Goa to Jodhpur takes 4.5 hours. Alternatively, you can drive; or take a train. Traveling from Goa in December, you can expect nighttime temperatures to be cooler in Jodhpur, with lows of 12°C. Finish your sightseeing early on the 9th (Sun) to allow enough time to drive to Jaisalmer. A World Heritage Site, the desert city of Jaisalmer has a number of historical attractions, buildings, and legends worthy of protection. Kick off your visit on the 10th (Mon): browse the exhibits of Maasa Miniature Art, then brush up on your military savvy at Jaisalmer War Museum, then take in the exciting artwork at Sonee Art Gallery, and finally take in the spiritual surroundings of Jain Temples. Get ready for a full day of sightseeing on the 11th (Tue): steep yourself in history at Dussehra Chowk, then steep yourself in history at Jaisalmer Fort, and then stop by Jai Shankar Handicrafts. To see other places to visit, photos, traveler tips, and more tourist information, refer to the Jaisalmer day trip planning site . Drive from Jodhpur to Jaisalmer in 6 hours. Alternatively, you can do a combination of train and taxi; or do a combination of bus and taxi. Wrap up your sightseeing on the 11th (Tue) early enough to travel to Jaipur. Kick off your visit on the 12th (Wed): look and learn at Jantar Mantar - Jaipur, get engrossed in the history at City Palace of Jaipur, then steep yourself in history at Amber Palace, and finally admire the masterpieces at Jitesh Arts. To see other places to visit, ratings, more things to do, and other tourist information, refer to the Jaipur holiday planner . Do a combination of taxi and flight from Jaisalmer to Jaipur in 3 hours. Alternatively, you can drive; or do a combination of taxi and bus. Expect a daytime high around 30°C in December, and nighttime lows around 11°C. Finish up your sightseeing early on the 12th (Wed) so you can travel to Udaipur. Kick off your visit on the 13th (Thu): take in the spiritual surroundings of Ekling Ji Temple, take in the exciting artwork at Art Haveli, then browse the exhibits of City Palace of Udaipur, and finally look for gifts at Little Armani. Here are some ideas for day two: explore the activities along Lake Pichola, take in the exciting artwork at Udaipur Art Villa, and then take in the exciting artwork at B. G. Sharma Art Gallery. For maps, photos, and tourist information, go to the Udaipur travel route planning tool . You can fly from Jaipur to Udaipur in 1.5 hours. Other options are to drive; or take a bus. Expect a daytime high around 29°C in December, and nighttime lows around 10°C. Wrap up your sightseeing on the 14th (Fri) to allow time to travel back home.